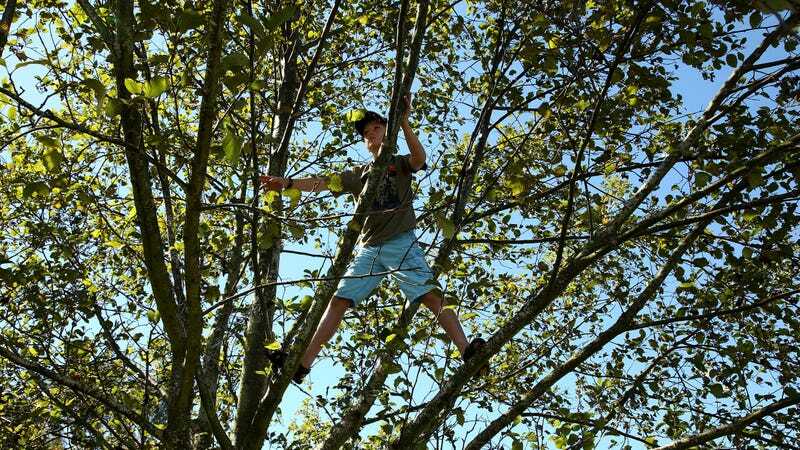 NBC has run a terrifying/innovative feature on a trend trendy parents are calling: “free-range parenting.” The meaning is stop helicoptering and, I dunno, let them fall out of a tree. It’s extremely controversial. The brouhaha began in 2008 when a woman who infamously left her child, age 9, in New York City’s Bloomingdale’s with a map and a Metro Card and told him to find his way home (he did; she is the “worst”). Utah passed a law in March in favor of free-range parenting, making it legal for children to play and walk home from school alone. NBC’s piece takes place at a Governor’s Island playground The Yard, running with an image of small children rummaging around plywood with rusty saws. If you see this image and think “TETANUS HOTBED,” then you are a helicopter parent. If you thought, “what a sensible way to teach organic real-world lessons, where can I sign up for a membership subscription?” then you are a free-range parent. This doesn’t apply to children facing actual hazards. Growing up in a poor neighborhood can reduce the chances children will graduate from high school, research has found. And true harm — abuse, neglect or other trauma — causes significant lasting effects, research shows. Here are some good trees.